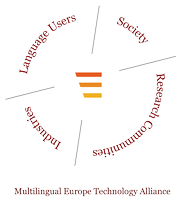 META stands for Multilingual Europe Technology Alliance. It is a European network of excellence forging this concept. One of their most renowned initiatives is their META-SHARE infrastructure that focuses on the sharing of language data and all sorts of processing and evaluation tools, with a particular emphasis on metadata, interoperability and language technology advancement. META has three vision groups: Translation and Localisation being one of them on top of Interactive Systems and Media and Information Systems. Pangeanic is very pleased to have contributed to META-NET’s initiatives. In September 2012, The Pangeanic Blog echoed The European Day of Languages, i.e. a call from META-NET that spelled out the problem of endangered languages in the European continent and beyond. Now, Manuel Herranz, Pangeanic’s founder, fully committed to the spin-off PangeaMT.com, will be one of the speakers of META FORUM 2013 “Connecting Europe for New Horizons” conference to be held in Berlin on 19th and 20th September. Manuel will take part in the Needs of European Industry Session in the afternoon of 19th September. This presentation entitled PangeaMT – Empowering European Users to Communicate Through Machine Translation will walk the META audience through the user-empowering functionalities of the web-based PangeaMT platform, with a particular focus on in-domain translation memory assets that allow for engine creation “at will”. Manuel stated: “I am very excited to participate in a great pan-European technological event introducing our latest research and developments in machine translation technologies. It is a great opportunity to present all features and potential applicatons of Pangea for European industry. The Language Industry is a key player and business enhancer and enabler.” Manuel would also like to use this opportunity to subscribe and stress the need for a European Service Platform for Language Technologies aimed at fostering the funding for meaningful research. However, this is also important for the training and participation of diverse linguistic and knowledge-specialist communities, particularly those of minority or less-resourced languages, via the provision of language data and technologies. This is of utmost importance to build user-oriented solutions ready for European citizens, no matter their practical information access, communication, learning or business need or their native language geo-location.